For over four decades, Nor-West Appliance has offered top-of-the line appliances, expert knowledge, and superior customer service to the Houston public. Nor-West Appliance does all this AND does it at builder prices to the public everyday. Nor-West Appliance takes great pride in learning about your specific situations in order to find the appropriate solution for your appliance needs. Because Nor-West Appliance is an independent dealer, they’re free to recommend better brands in every category. No, it’s not the fanciest store in Houston. It’s just the one Tom trusts for appliances. Look for the yellow store at the corner of 290 and Mangum. 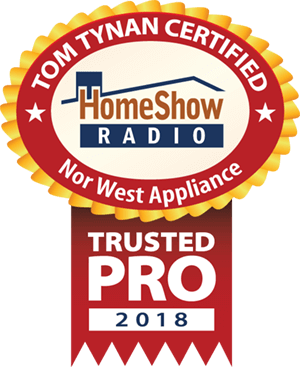 Serving the Greater Houston area, Nor-West Appliance is a trusted HomeShow Pro, certified by HomeShow Radio’s Tom Tynan. How can Nor-West Appliance help you? • Could an Induction cooktop stove be the tool to get things cooking for you?